The walk to the the Wave is really not all that difficult. There are only a few hundred feet of elevation gain, and it is only about 3 miles from trailhead to the Wave proper, so one would be hard-pressed indeed to consider it anything more than a moderate hike. 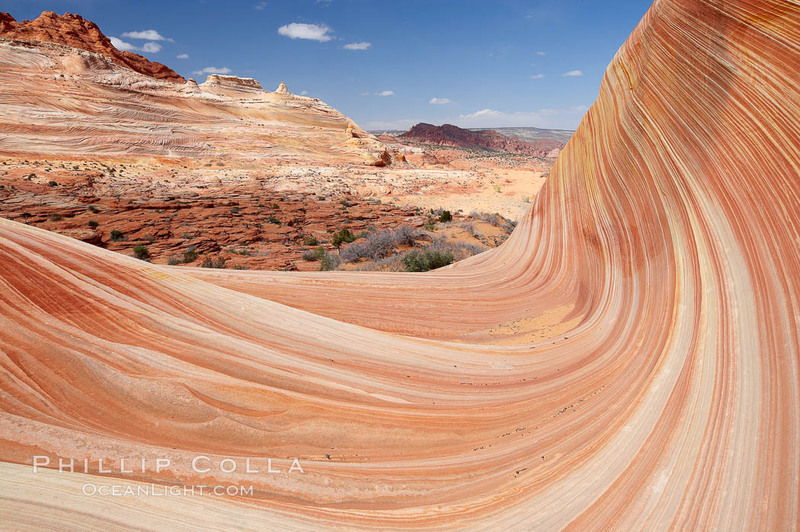 The terrain is wonderful and varied: striated and eroded sandstone slopes, dramatic buttes and a number of large cones are seen along the way. Some of the trail is soft sand, while the rest is sandstone slickrock. Lightweight hiking boots (the kind with grippy soles for adhering to the slickrock) or running shoes are what is called for in this area. I tried to use my walk as a workout in lieu of my daily run, travelling out to the Wave at a fairly quick clip, only stopping once for a photo. Nevertheless, in spite of the pace I was able to admire the grand surroundings that rose up around me. About 60 minutes after leaving the trailhead I reached the top of the final sandy section of the trail and had arrived at the entrance to the Wave. Turning around to view the area I had just covered gave this view. Note the bluff in the distance, in the upper left of the photo: the entire bluff is an amazing cross-hatched display of stratified sandstone, with every shade of red, yellow and orange imaginable. In the foreground is the bowl-like entrance to the Wave. More tomorrow.